This is one of the quintessentially English summer puddings: massive, creamy and delightfully unpretentious. This recipe makes about 32 small meringues, so save the extra 16 for later. First, make the meringues. Preheat the oven to 140˚C/gas 1. Line a baking tray with non-stick baking parchment. In a very clean bowl, whisk the egg whites until they form firm peaks. Gradually mix in the sugar and salt and whisk well until the mixture is thick. This should take about 8 minutes: an electric mixer is a blessing here. Spoon the mixture into blobs on your baking tray, leaving large gaps between. Bake for about 1 hour. Meanwhile, make the compote. In a pan, boil 75ml water; add the sugar and then the rhubarb when it starts bubbling. Stir and let it cook for 5 minutes. When the rhubarb is tender, remove from the heat. Add the rose water and set aside. For the mess, use a large bowl or six glasses. Whip the cream until just soft. 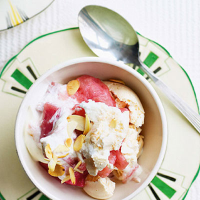 Mix it with the rhubarb and mash in 16 meringues. Serve with toasted, flaked almonds. This recipe was first published in Wed Apr 01 01:00:00 BST 2009.